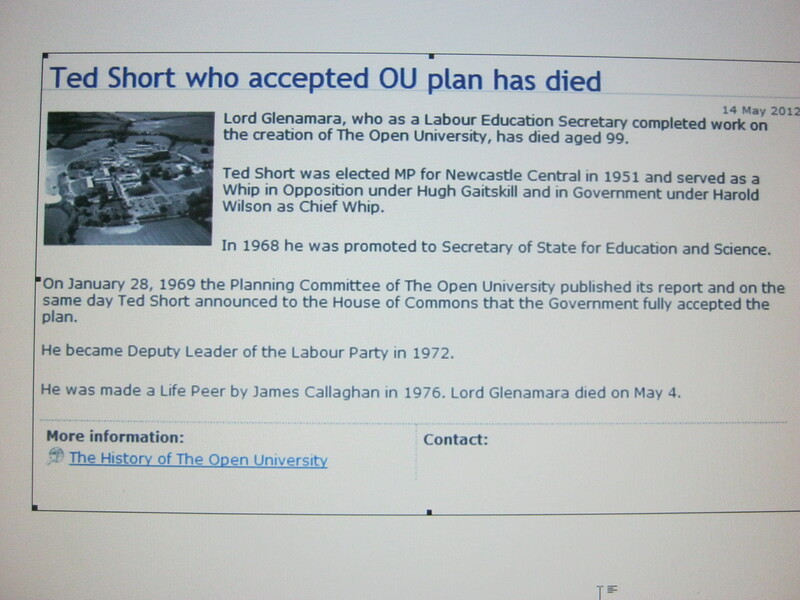 Edward Pearce’s obituary of Ted Short (Baron Glenamara) who died aged 99 on 4th May, notes that he ‘took charge of the final stages of creating the Open University, perhaps the best thing any Wilson government did’. In a similar vein in 2004 Edward Graham (Lord Graham of Edmonton) who left school aged 14 and was one of the first students at the OU, attributed the creation of the OU to Harold Wilson, Jennie Lee and Ted Short. The OU opened in 1969 and in 1970, before any students had started to study with it, a new government was elected. William van Straubenzee, the Junior Minister for Higher Education in the Tory government of 1970-74, said of the OU ‘I would have slit its throat if I could’. However, he felt that his violent enthusiasms were curtailed by Ted Short the Labour Education Minister whose ‘nifty, last-moment work with the charter that made the OU unkillable’. Perhaps this manoeuvre endeared Short to Wilson who kept him in his post at Education while Labour was in opposition in the 1970s. Short maintained his support for the OU, asking pertinent questions in the Commons (here for example ) and penning a couple of couple of pieces in the trade press which argued against the cutting of places at the OU, the diminishing the quality of the OU due to budget cuts and the attempt by the Conservatives to create what he called a ‘Not-Quite-So-Open University’. In one article he concluded: ‘one of the most imaginative concepts of the Labour government will be used for a purpose for which it was never intended. Goodbye second chance for thousands who missed out early in life’. Ted Short may have gained a place in history as the Minister who was able to say ‘for the first time in our history, next year expenditure on education will exceed that on defence’. He should certainly have a place in the history of the OU as a stalwart, and tactical, defender of the fledgling institution. This entry was posted on Monday, May 14th, 2012 at 8:00 am by Daniel Weinbren	and is filed under People. You can follow any responses to this entry through the RSS 2.0 feed. You can leave a response, or trackback from your own site.